(Updated June 26 to reflect court decision, add NOI reaction) The issue may have been preservation of Section 5 of the Voting Rights Act, but the buzz at a series of rallies in Alabama today was clearly the presence of Nation of Islam leader Minister Louis Farrakhan. The controversial figure, who has a history of anti-Jewish, anti-gay and anti-white statements, was brought in by the National Coalition of Leaders to Save Section 5, a coalition of mainstream civil rights organizations to boost their caravan protesting a case currently before the U.S. Supreme Court. Jewish groups, which have generally supported Section 5, voiced their discomfort at Farrakhan being brought in for these rallies, and at stops in Birmingham and Montgomery, Farrakhan and supporters fired back. The title is similar to a set of books published by the Nation of Islam which tries to prove that Jews controlled the slave trade. In the Alabama report, the history of many prominent Jewish families in the state was described as proof that “Jewish history of anti-Black hate and terror goes back to the Alabama slave trade.” Names listed included Proskauer, Moses, Lehman, Engel, Sterne, Denaburg, Hanan, and Rabbis Newfield and Grafman, among several others. The diatribe also mistakenly attributes authorship of Governor George Wallace’s infamous “Segregation Forever” to his attorney, John Kohn, instead of the true author, the rabidly anti-Semitic Asa Carter. The legal issue revolves around Shelby County vs. Holder, which was heard at the Supreme Court in February. Shelby County, just south of Birmingham, seeks a ruling that Section 5 “preclearance” provisions are unconstitutional. For 16 states that have a history of issues regarding voting access for blacks prior to the 1965 Voting Rights Act, any changes to voting must be cleared with the Justice Department. That includes changes from district borders to the location and hours of voting precincts. Congress reauthorized the provision in 2006, but Shelby County says that level of bureaucracy is no longer needed to eliminate voting discrimination. On June 25, the court did not strike down Section 5, but instead struck down Section 4, which is the formula for determining which jurisdictions would be subject to preclearance — ending preclearance unless Congress takes action. At the rallies, the issue was framed in terms of “rolling back the clock” to 1963 and that overturning Section 5 would result in efforts to take away the vote from blacks. The rallies began at Kelly Ingram Park in Birmingham, where the 1963 civil rights demonstrations took place. The park is diagonal from the Sixteenth Street Baptist Church, where caravan organizers originally said the rallies would begin. However, church leaders said they were never consulted and hosting Farrakhan would be contrary to the church’s position as a symbol of reconciliation. Many of the speakers still invoked the name of the church and the four girls who were killed in September 1963 when the church was bombed. The caravan then continued to the Shelby County Courthouse, the Edmund Pettus Bridge in Selma and the State Capitol in Montgomery. 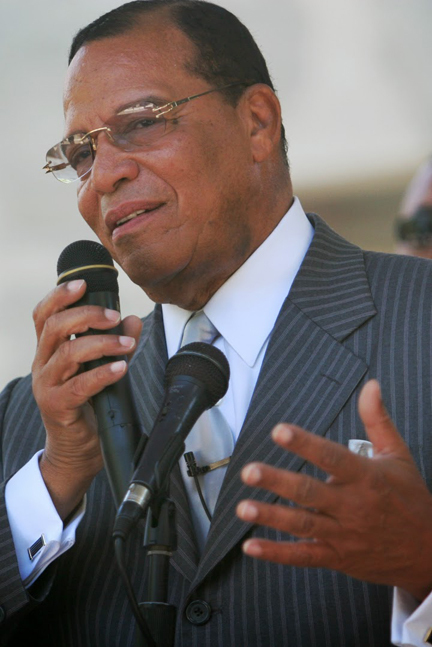 Bill Nigut, Southeast regional director of the Anti-Defamation League in Atlanta, said while the ADL has frequently spoken out in favor of extending Section 5, "the inclusion of Louis Farrakhan in this campaign is a terrible mistake." The Southern Poverty Law Center in Montgomery, which monitors hate groups, considers Farrakhan a “black supremacist” and lists the Nation of Islam as a hate group. The SPLC does support Section 5. According to Federation Executive Director Richard Friedman, who attended the Birmingham rally, “particularly frustrating… has been the unwillingness of black elected officials to step forward and distance themselves publicly from Farrakhan” and condemn his anti-Semitism as Michigan Rep. John Conyers recently did days after attending a Farrakhan speech in Detroit. Many of the speakers at the Birmingham rally, noting the Federation’s initiative, spoke derisively of “scared Negroes” who did not want to be seen with Farrakhan. Some media reports erroneously stated it was the Birmingham Jewish Foundation, instead of the Federation, that was concerned. She mentioned voter identification laws, changes to early voting, changing voting times and polling places as efforts to eliminate the black vote. Farrakhan stated that having a law like the Voting Rights Act without any sort of enforcement mechanism makes a “mockery” of law. Overturning Section 5 would lead to long, expensive court battles as “recalcitrant” individuals try to take away voting rights. “We want laws enforced. We want justice,” he said. In Montgomery Farrakhan directly addressed Friedman’s appeal for others to disassociate themselves from him. “How arrogant that sounds from someone that lives in Alabama,” he said. Charles Steele, CEO of the Southern Christian Leadership Conference, whose first president was Martin Luther King Jr., introduced Farrakhan. Were it not for Farrakhan, he said, “SCLC would be out of business.” Steele said the organization was out of money and the lights were off. He called Chicago and visited Farrakhan, who “prayed for us. He blessed us,” and then wrote the SCLC a check. After that, the organization was able to raise $20 million, Steele said. Tuskegee Mayor Johnny Ford, one of the caravan organizers, said Farrakhan “is the honorary mayor of Tuskegee for life.” Farrakhan spoke in Tuskegee in March. When they were organizing the caravan at the SCLC offices, Ford said, the feeling was that “we cannot really have a movement until we reach out and invite Minister Farrakhan, who is the only black man in America who was able to bring 1 million black men” to Washington. Rev. Scott Douglas, who heads Greater Birmingham Ministries, urged the crowd to remember the civil rights martyrs killed in Mississippi in 1964, Andrew Goodman, Michael Schwerner and James Chaney, two of whom were Jewish, and mentioned that the only white clergy member to visit the Scottsboro Boys in prison was Rabbi Benjamin Goldstein of Montgomery. About 250 attended the Birmingham rally, and several hundred were in Montgomery. In Selma, Farrakhan marched across the Edmund Pettus Bridge, site of the Bloody Sunday demonstrations in 1965. He was joined by Selma Mayor George Evans.